Research in this lab focuses on the interface of computer and information sciences, neuroscience, and psychology. We develop tools and strategies to employ inter-disciplinary expertise in psychological and neuroimaging research. Our projects range from tailored solutions to specific problems (e.g. PyMVPA) to versatile research platforms (e.g. NeuroDebian) and data management systems (e.g. DataLad). 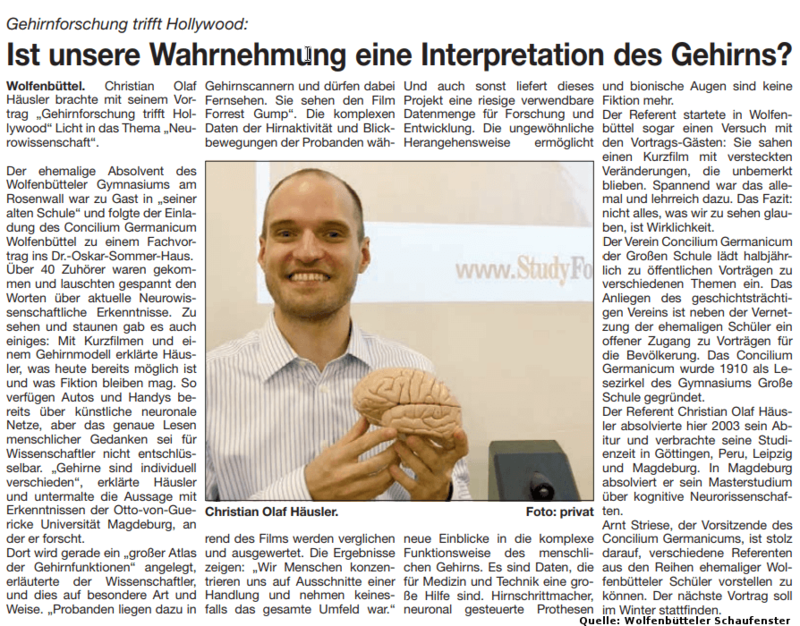 Christian Olaf Häusler's popular science talk "Psychologie & Gehirnforschung treffen Hollywood: Was können Neurowissenschaftler in Deinem Gehirn sehen, während Du einen Film schaust?" has been covered in Wolfenbüttler Schaufenster: "Ist unsere Wahrnehmung eine Interpretation des Gehirns?". The use of complex natural stimuli in the lab's human imaging studies plays a role in this half-hour SWR2 radio feature on animal experiments in medical research (2018; about 4min from the ~11 min mark). 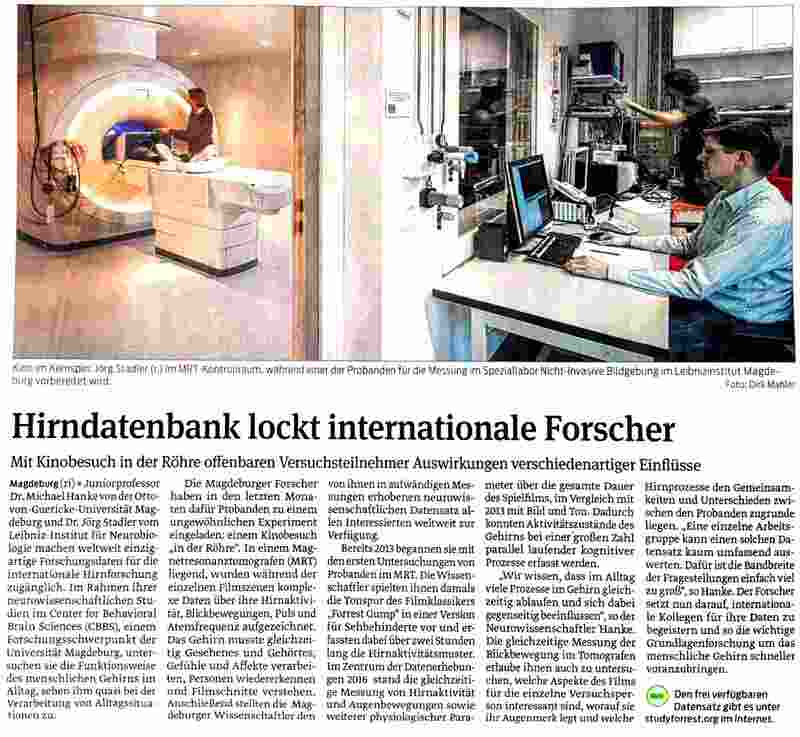 The 2016 extension of our studyforrest dataset has received wide-spread media attention: "Hirndatenbank lockt internationale Forscher" (Volksstimme 21.11.2016), psychologie-aktuell.com, radiologenverband.de, gesundheit-sachsen-anhalt.de, medizin-aspekte.de, neurologen-und-psychiater-im-netz.org. We participated in the Committee on Best Practice in Data Analysis and Sharing (COBIDAS) that produced a comprehensive report on how to conduct and report neuroimaging studies to aid reproducibility in this area of research. This work has been featured in the New York Times article "Do You Believe in God, or Is That a Software Glitch?". Our contributions to the Open Science movement have been highlighted in this Süddeutsche Zeitung article: Freie Daten für freie Forscher. The initial data release of our studyforrest.org project has been reported on the German tech news site heise.de: Open Science: Forschungsdaten frei zugänglich. Magdeburger Hirnforscher veröffentlichen den bislang umfangreichsten Rohdatensatz über die Verarbeitung von Sprache im Gehirn.